This is the reason why I finally got an Apple device. Make sure you include www on other addresses. There are other repositories available online but these are my recommended ones. To delete a repository, just tap Edit and then tap then delete sign on the repository you want to erase. Sometimes, repositories may not be available so adding them might not be successful. Check if you have proxy servers or firewalls on your internet connection. Also, the speed and connection quality will affect your downloads and Cydia operations. Try again at another time if it does not work the first time. Of course, you should know how to undo whatever tweaks/installations you did if ever something goes wrong or if you just don't like the tweak/app you installed. There are several ways to do this. One is to install Cydelete from Cydia which will allow you to delete Cydia apps like regular apps (holding the icon and tapping the delete button when they start shaking). This will not add a new app icon but it will work instantly. Cydelete, like other tweaks/apps from Cydia will not add a new icon which you can do the normal deleting process. Hence, you should do the other method if you cannot find the icon of the app you want to delete. To do this, you should open Cydia, then go to Manage, then choose Packages. This will list ALL cydia files (tweaks/apps/fonts/themes/etc) installed in your device in alphabetical order even if they do not have an icon on the springboard. Just scroll to the file you want, open it, then tap on the remove or modify button on the upper right hand corner of the screen. Just follow on screen choices after. Remember that apps/tweaks are made by different people and some cannot test their apps/tweaks on all generations of iphone/ipod touch and the different firmware versions. Also, tweaks/apps can have conflicts on other tweaks/apps already installed on your device. In short, not all tweaks/apps will work on your device. Always read the description information of the tweak/app before installing. 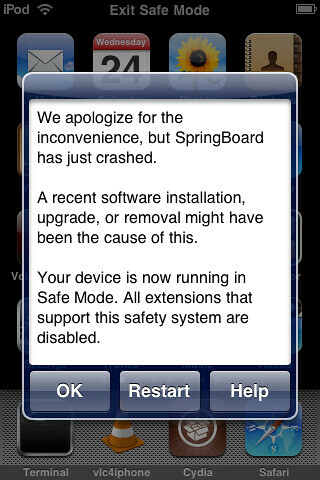 Some incompatible tweaks/apps will not only work on your device but also cause bugs and/or eventually cause the springboard to crash. If this happens, you may try to restart the springboard to see if it will work or you can tap okay and then delete the app/tweak that caused the problem. Tweak/apps that are graphics heavy like animated wallpaper, motion flow docks/boards, etc. will have an impact on your battery life making it shorter and/or use up more RAM (memory) which will lead to crashing of other apps therefore I don't recommend them. Try reastart or delete the app that caused the crash. Now that you have the basics covered, you may now proceed in getting all the tweaks/apps you want. You may go to the Sections screen in Cydia which has all the available files sorted in various folders. Not all tweaks/apps are worth downloading and some might just cause problems in your device so be warned. Try to read reviews on it first and make sure that it is compatible to your device. The following are some of my favourite Cydia tweaks/apps aside from SBSettings (click here for review) and Bytafont (click here for review) which I personally use. Just search them on Cydia (make sure you have the correct spelling and the repositories) and install them. The list is not in any particular order as these tweaks do different things which makes them a must have for your iDevice. They will not add a new icon on your springboard so don't bother looking for them. You can go to Settings and scroll down to see if they are listed and adjust the various options or go directly to the app they tweak (Photo Album, Email, etc) to see if they work. This tweak will allow you to unlock your Apple device like an Android Phone. It's good because you can make so many pattern combinations and unlocking is more comfortable than tapping a series of numbers specially when your fingers get used to the pattern. It has lots of options on the Settings menu like using themes and adjusting the transparencies of the lock elements which I personally have set to lowest so I can see my beautiful wallpaper fully. Be warned though, oily hands and finger smudges will easily show your pattern so clean your fingers and screen often. This tweak will give you and option how many icon columns and rows you want for your springboard. This will maximise your screen and will help you scroll less and see the app you want easily. This is best used with the Five Icon Switcher and the Five Icon Dock tweak from Cydia if you want 5 columns to make it look uniform all over. Multitasking on the iphone/ipod touch is great, but closing them can be a pain. You have to double press on the home button then tap + hold the icons to close each app. To remedy this, install Direct Closer Pro which will automatically add the delete badge on every app so you don't have to do tap + hold on the icons every time you want to delete them. Its very convenient and I have never accidentally closed any apps I am using even if the delete badge is present. I confess, I am a bit of an OC (Obsessive Compulsive) so I get irritated when the names of apps are not uniform (capitalization, overlapping, too short/long). 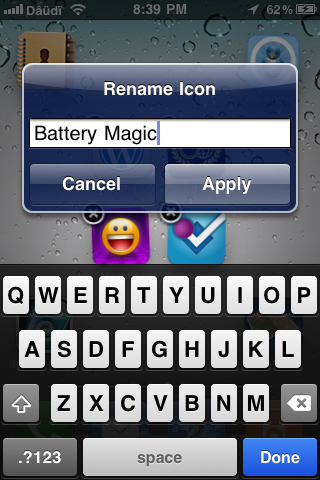 This tweak will enable you to change an app's name to anything you want (even using emoji characters). This is one of the many simple things Apple should have included in the official iOS but didn't so we have to jailbreak our devices just to get these small tweaks which greatly improve the usability of the device. 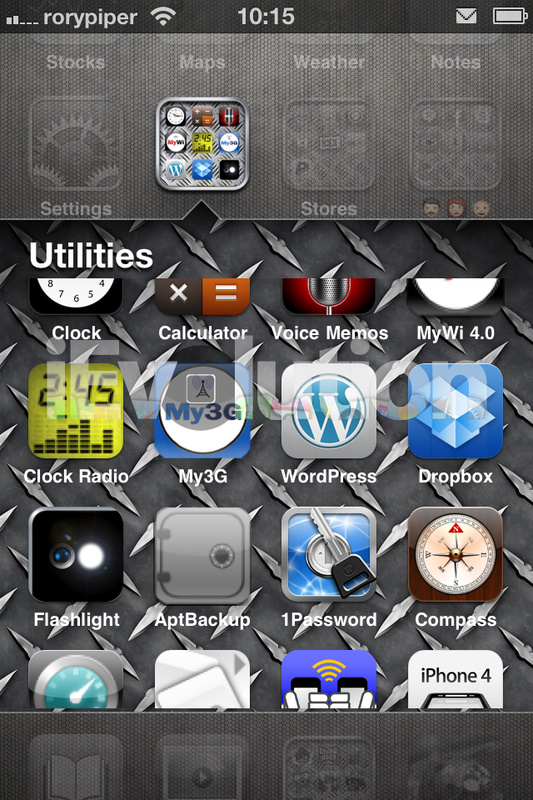 Making folders on the iphone/ipod touch is great but its limited to 16 icons per folder. Most of the time, we need more than 16 icons so we make another folder name Games 2 and then fill that up so we have to make another. Infinifolders give you the ability to add as much apps in one folder as you need and the ability scroll up and down the folder. There are other folder tweaks in Cydia like Folder Enhancer and such that have more features such as folders in folders function but they cause conflicts in Itunes and other programs so you may try them at your own risk. This tweak will shorten the various system animations such as the loading icon, app switching transition, and others making it look faster than usual. This is just a visual tweak and does not overclock the CPU nor it affects battery life. 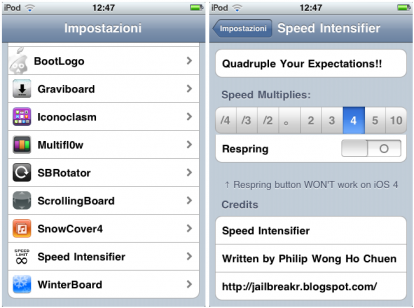 You can choose the speed you want and then respring to apply the effect. I got this tweak because of the Power Alerts which bugs me a lot. You have the option to dismiss all the power alerts altogether or adjust it so it appears on the percentage you want. It will also give enable sounds on iphone start-up or when your battery is fully charged to prevent overcharging. Moreover, you can also tweak status bar labels (on/off) and homepage indicators. This app is the first app I bought from Cydia. It pains me to realise that you cannot make new folders inside the default Photo Album other than the Camera Roll and sort your photos. Its quite daft as the simplest camera phones can do this feature easily but the sophisticated iphone/ipod touch can't so once again we turn to jailbreaking and Cydia apps. This app will be able to make new folders and even able to make them private by locking them with a password. This will tweak the default Photo Album app and not add a new app which is the best thing for me as it works seamlessly. By default, you can only email photos in your photo album one at a time and you cannot attach photos on the email app. This tweak breaks that limit and adds an option to add as much photos you want while composing an email. You will also have an option to resize the photos before sending them. You cannot use your iphone/ipod touch while it syncs to Itunes and other programs which makes it useless for long periods of time specially when you transfer files or when you are backing up your data. This tweak will make that go away as it will make the syncing a background process and you will be able to do other things while you are syncing. nice! I'm looking for something like the icon renamer! thanks man!